This is one of those inexplicable cases of a humdrum potboiler achieving cult recognition in later life. Thematically a distant cousin of Cat People, but with none of that film's atmosphere and moody tension, this is a war movie with a difference, in that American GIs face death, not from Nazi bullets, but an ancient curse. 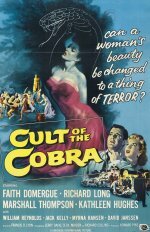 When a group of overly curious soldiers enter an Indian temple during a secret ceremony, they're followed home by an exotic serpent woman who starts bumping them off one by one. Francis D Lyon's direction is uninvolving, but his film is saved by solid performances and imaginative camerawork. Watch out for future Fugitive star David Janssen in a minor role.